My Horse Is Acting Out: Is He Stressed? A stressed horse as evidenced by facial expression and disengaged eyes. Watch Out! When your horse is acting out, it makes life difficult for you, but asking why is key to understanding his behavior. "Yes, he is most likely stressed." 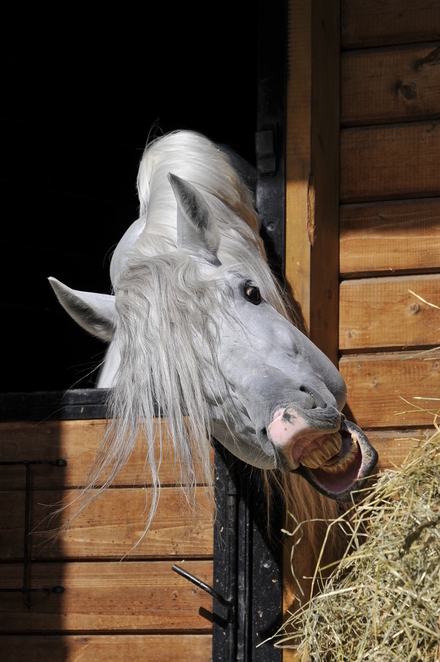 Anything that challenges the horse's ability to function normally is called a 'stressor'. These can be anything from being too hot or cold, hungry, scared or frustrated. They can also be exciting things like galloping with the herd, or getting sweet feed. 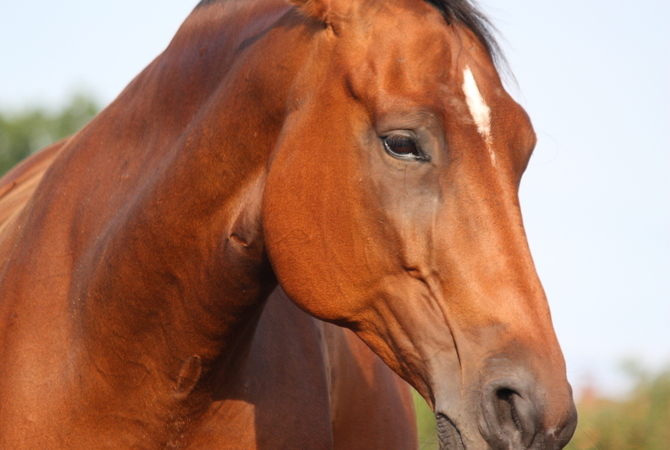 It's normal and natural for horses to experience stressors. They'll cope as long as they have the time and ability to overcome these challenges e.g. a sheltered area to escape the wind and rain, forage to eat when they feel hungry, a chance to walk off the effects of strenuous exercise and so on. However, not all challenges are so easily overcome. Place yourself in the hooves of a horse who is stabled overnight away from his pasture buddies. He hasn't been given free choice hay so half way through the night he becomes hungry. The very worst stressors are frequent, unpredictable, inescapable and unavoidable. These are the hardest of all to cope with and they can have serious negative effects on a horse's health and behavior. Social Isolation: Call for friends, listen for replies, move towards reunion. Hunger: Look and smell for food. Eat food. In drought or snowy conditions this may include digging for food - hence why horses paw when they feel frustrated! Threat of predatory attack: Run from danger. Attack aggressors. The long term fix includes release of steroid hormones such as cortisol, helping the horse to preserve and repair the body's resources. Adrenaline doesn't last long in the horse's system, but cortisol lingers longer. Horses that are exposed to frequent stressors, especially ones that are hard to fix, remain 'stressed' for longer periods of time. They end up with more cortisol in their system more of the time. This chronic problem isn't healthy. Imagine you had barely a wink of sleep, tossing and turning in your bed, your pessimistic imagination running riot. You wake up late with a headache, spill your morning coffee as you try to gulp it down, then get stuck in a traffic jam on your way to work. When you do finally get into the office you're held to blame for failings outside of your control: suppliers not fulfilling orders on time, customer complaints from days you weren't even at work and so on. Tired and grumpy you finally make it home and your loved ones tell you the fridge is empty. How do you react? 'Trigger stacking' describes how a series of stressors can turn into a seriously bad hair day and cause 'over threshold' behavior such as hyper vigilance and over-reactivity. Compare that to how you might have reacted on a good day. Horses get days like this too. Every time we have them live in circumstances where they cannot freely fulfill their natural instincts and desires, and where they are subject to human demands they do not understand or are fearful of. Place yourself in the hooves of a horse who is stabled overnight away from his pasture buddies. He hasn't been given free choice hay so half way through the night he becomes hungry. Horses only take 5 hours rest, divided into shorter naps so he has a large time vacuum. Morning comes and his owner is late to the barn. The other horses are fed and turned out to pasture but he has to wait. When his owner does show up he bolts his feed, and dances to the pasture earning him a yelling at and a yanking on his lead chain â which given how fresh he was, had been pre-emptively wrapped over his nose. When he is turned out it turns out there's a new horse in the already crowded pasture, and there is little hay left in the feeder. The day is spent switching between fighting with and avoiding the tough horses. Towards the end of the day this gets worse as the horses compete at the gate to be brought in for sweet feed and hay. Then right before he's due to be put in his stall, his human takes him to the riding ring for a lesson she has scheduled. It turns out that he rushes his fences, so the trainer tries to address this by trying a new, more severe bit rather than a review of his motivation to rush in the first place. It's also the case that his saddle pinches, but the fit hasn't been checked in the last 18 months. Horses who are living with these kinds of issues; excessive stabling, isolation from others, frequent mixing of strangers, inadequate access to forage, badly fitting equipment, painful handling and riding procedures experience trigger stacking every day. They often know that bad things are going to happen, but not exactly when, and they worry about it. These horses respond by becoming depressed and withdrawn, they are sluggish and unresponsive, sometimes exhibiting occasional and unpredictable outbursts. In other cases they are hyper vigilant, over-reactive, and often dangerous, bucking, shying and disobedient because they are frightened and confused. In either case the daily living conditions are the same, sharing those common features of frequent, unavoidable, inescapable stressors. This is how we can identify stress whenever we suspect it is behind our horse's unwanted behavior and unhappiness. When a horse's life is lived well, it is full of freedom, forage and friends. Human companions are predictable, clear about their intentions and in their instructions, and have their horses participate in activities they have been set up to succeed in. The possibility for equine enjoyment has not been ruled out. In fact, it has been actively embraced. Jenni Nellist is one of Great Britain's most popular equine behaviorists. She provides consultation services to help people who are interested in learning about equine behavior. Search for new learning took Jenni to the university in Aberystwyth and an equine science degree. There she learned that not all the answers are actually available and that she would have to question things for herself and learn how to test ideas in order to form her own opinion. In her twenties, Jenni practiced what she had learned, and through trial and error, established a practical hands-on understanding of techniques that would lead to horse training success. In order to make sense of what she was exploring she went back into education, this time an MSc in Companion Animal Behaviour Counselling at the University of Southampton. Really understanding how horses function, at all levels, makes it possible to understand why problems arise and to go about tackling an individual’s problem humanely without becoming method bound. These days she spend most of her week working with horse owners who are seeking knowledge in order to improve their own horsemanship skills and resolve a great variety of training and behavioural problems. Visit Jenni's Website to learn more about her services. Jenni also invites you to visit her facebook page.